The algorithm is a simple recursive algorithm, from each cell first print all paths by going down and then print all paths by going right. Do this recursively for each cell encountered. The idea behind its solution is quite simple and straight. Recursively convert the left subtree to DLL. Then find inorder predecessor of root in left subtree (inorder predecessor is rightmost node in left subtree). Make inorder predecessor as previous of root and root as next of inorder predecessor. If right subtree exists, process the right subtree (Below 3 steps are similar to left subtree). 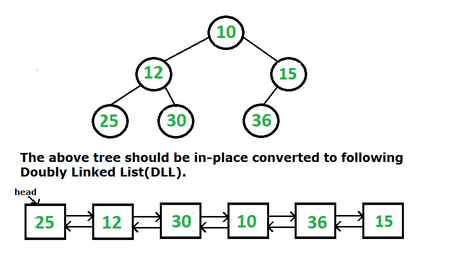 Recursively convert the right subtree to DLL. Then find inorder successor of root in right subtree (inorder successor is leftmost node in right subtree). Make inorder successor as next of root and root as previous of inorder successor. Find the leftmost node and return it (the leftmost node is always head of converted DLL). Program to rotate a matrix by 90 degree clockwise. You have to rotate the matrix by 90 degrees. * Created by Aniket on 1/26/14. Note : Above algorithm takes O(N^2) time complexity. Sum of all the numbers that are formed from root to leaf paths. Given a binary tree, where every node value is a Digit from 1-9 .Find the sum of all the numbers which are formed from root to leaf paths. For example consider the following Binary Tree. The idea is to do a preorder traversal of the tree. In the preorder traversal, keep track of the value calculated till the current node, let this value be val. For every node, we update the val as val*10 plus node’s data. * Created by Aniket on 1/24/14. For the java code corresponding to TreeNode data structure refer to the earlier post. Given an array you need to convert it into an balanced BST(Binary Search Tree). Given an array first step would be to sort it. You can probably use quick sort which will take average time O(NlogN) complexity. Once you have sorted you can apply following algorithm to convert it into a balance BST. Get the Middle of the array and make it root. Recursively do same for left half and right half. Get the middle of left half and make it left child of the root created in step 1. Get the middle of right half and make it right child of the root created in step 1. * Created by Aniket on 1/22/14. Code to transform a sorted array into balance BST. Pre-order traversal is a type of tree traversals. You can take a look at the types and code for each in the previous post on Tree traversal. Building Java projects with Maven. In last post we saw what is maven and how do we install it. Now lets create a java project and use maven to build and then test by running it. 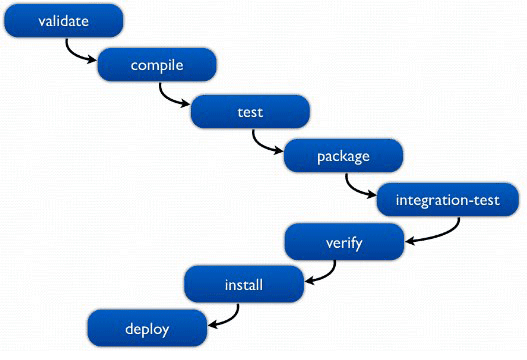 Projects that are to be built by maven must follow a particular directory pattern. For detailed directory structure you can visit their documentation on directory structure. For our example we are going to create a HelloWorld sample inside a package called hello. Now inside hello directory create two java files - HelloWorld.java and Greeter.java. Now that Maven is installed, you need to create a Maven project definition. Maven projects are defined with an XML file named pom.xml. Among other things, this file gives the project’s name, version, and dependencies that it has on external libraries. Note : This file must be in the project root directory which means in the folder which has src folder. This will download your dependencies and compile you java files. Corresponding .class files will be created in a target folder in the projects root folder. For more details on the maven build life cycle phases you can visit their official site. I am getting Can't execute jar- file: “no main manifest attribute”. What should i do? That is because you have not told maven while packaging how do you built the project. You need to provide build information withing <build> and </build> tags in the build file. You can add following tag between <project> and </project>. and you are done. By this you essentially say what is your main class so that while executing java knows the entry point from that jar file. I want to use IDE instead of text editor. How do I import maven projects to my IDE? For example idea command will generate all the required files like .ipr(project file), .iws(workspace file) etc. You can open the file by simply opening this .ipr file in IDEA. Note : As per Mavens official site mvn idea:idea is obsolete. You can directly do File -> Import project and select pom.xml file. I am getting "Package name does not correspond to the file path" error after importing project in my IDE. This is because dash(-) is not allowed in package name and your -DgroupId contained dash(-) which was used as package name. You can refactor and replace dash(-) with underscores(_) which is legal in a package name. How to install maven on Ubuntu? I am using Ubuntu so I have apt-get. You can use yum if you have Fedora/CentOS. v here stands for version. You can also type complete word i.e mvn -version. You will see some details about the installed maven package. This indicated maven is successfully installed. Using apt-get you may not get the latest version of maven. For latest version download the binary from maven site and install it. settings.xml has default configurations like path to local repository. yes maven downloads dependencies and stores it in a local repository so that there is no need to download same dependency twice. Path to maven(mvn) executable is not added to $PATH variable then how is the command recognized? Now if you see the contents of /usr/bin you will notice that it has mvn executable. It is actually soft link to the actual executable. This approach is a common approach. We cannot keep adding all installed packages folder to $PATH. Instead create a soft link to executable and keep it in /usr/bin and add this to the $PATH. This was just how do we install maven on ubuntu. In the next post we will see how to compile and run Java code using maven. Race Condition, Synchronization, atomic operations and Volatile keyword. In this times where multi-threading is an essential feature of almost all systems it is very important for the programmers to handle race conditions. All the concepts mentioned in the title of this post - Race Condition, Synchronization, atomic operations and Volatile keyword are very much related to each other and understanding them together will give you a better and bigger picture of Concurrency. Consider a very simple increment(++) operation. There is a common misconception that incrementing is an atomic operation. If you are wondering what atomic operations are then be patient. We will discuss it in a more detail later. For now you can understand atomic operation as an operation that takes only one CPU cycle. But is is not. 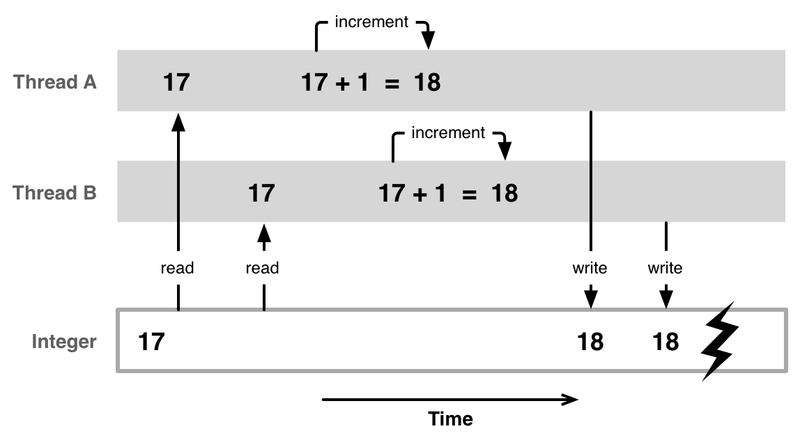 Incrementing is not an atomic operation. If you think a bit deeper you can imagine increment operation as sequence of following operations. Read the value from the memory. Write the changed value back to the memory. Individual operations may or may or may not be atomic in nature(Will cover this in volatile section). But for our current discussion lets say the counter is of type int and read/writes for it are atomic. That means as far as our discussion on race condition using increment is considered each subdivided operations mentions above happen in a single CPU cycle. So yes this a problem that every programmer faces while programming in multi-threaded environment. So what is the way out? One could say make an machine level increment operation that happens in a single CPU cycle(or in other words make the increment operation atomic). But we cannot make those machine level changes can we? There are other alternatives or work a rounds that will help us solve the problem. And the first one of it is called - Synchronization. To avoid race conditions we can use synchronization. By synchronizing a part of code we ensure that only one thread can process that part of the code. In java either you can have synchronized methods or blocks. To understand the difference between above two it is essential to understand how synchronization mechanism works internally. Java is an Object oriented programming language and everything in it is essentially an Object. Each Object is associated with a monitor. Synchronization involves e thread getting a lock over this monitor. If one thread has a lock over the monitor other thread cannot acquire the lock and consequently cannot access the area governed by that monitor. Now for instance methods lock is acquired for monitors of the instance itself. So for example if you have a getData() method of the Employee class then the lock obtained is on the individual Employee instance. On the other hand for static methods lock obtained is over Class instance of the Employee instance. You can get this Class object by using ClassName.class or classInstance.getClass() method. And this Class instance is same for all the individual Employee instances. Refer : Interview Question #13 synchronization on static function/method. So for above counter problem we can synchronize the increment operation with a synchronized function or a block. Eg. That is all about the basics of synchronization. We may go into more detailed discussion in another post. But the basic concept of what is synchronization and why is it used should be clear by now. Synchronization is an alternative for operations that are not atomic. So now lets see what atomic operations are. As mentioned previously each higher level language operation may require one or more CPU cycles to be completed. It is very much possible that before all the cycles needed for a particular operation are completed there may be context switch and some other process or thread might take control of the CPU resulting in race condition we discussed above. Though we cannot actually manipulate processor instructions there are work a rounds to make an operation atomic. "The Java language specification guarantees that reading or writing a variable is an atomic operation(unless the variable is of type long or double). Operations variables of type long or double are only atomic if they declared with the volatile keyword." Even if not lets see what it means. It means read and writes of primitive variables are atomic in nature. Exception to this is long and double. Answer : It's not atomic because it's a multiple-step operation at the machine code level. That is, longs and doubles are longer than the processor's word length. So on a machine where processor's word length is greater than the long/double size it is possible for the corresponding read write operations to be atomic. Note : Also note it says only read and write. So do not confuse it with any other operation like incrementing, As mentioned above increment operation itself is composed of 3 sub operations listed above. For the purposes of the Java programming language memory model, a single write to a non-volatile long or double value is treated as two separate writes: one to each 32-bit half. This can result in a situation where a thread sees the first 32 bits of a 64-bit value from one write, and the second 32 bits from another write. Writes and reads of volatile long and double values are always atomic. Writes to and reads of references are always atomic, regardless of whether they are implemented as 32-bit or 64-bit values. So another way to make read/write for long/double is to declare them volatile. I have just mentioned it here since it comes under atomic title but will discuss it more in next topic - Volatile variables. Java specially provides atomic classes for purposes like this. For eg we have AtomicInteger or AtomicLong that provides methods like getAndDecrement(), getAndIncrement() and getAndSet() which are atomic. Synchronization solves the problem faced due to race conditions but there is one another problem that we have missed and that is - visibility. Here synchronization makes sure that only one thread enters the function and no other thread is allowed to access it until the thread which has the lock over it's monitor completes it's execution. But what about the variable visibility? Thread T1 lets say identifies that _instance is null. It acquires lock and creates new object but before the it comes out of the function lets say there is a context switch. Though new variable is created some other thread in some other function will still see _instance as null . This is because each thread caches the value of a variable and the synchronization among threads happen only when the synchronized method or block is completely executed. To overcome this problem we use volatile keyword. Volatile keyword in Java guarantees that value of volatile variable will always be read from main memory and not from Thread's local cache thus solving the visibility issue. Now lets come to the Long and Double issue and how making it volatile make it's read and write atomic. So there is this another concept - happens before relationship that volatile keyword follows which means if there is a write operation with subsequent reads then reads will be processed only after write is successful. 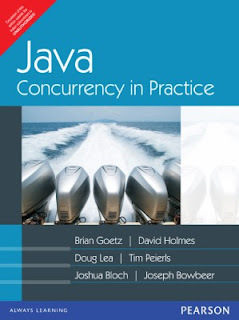 This post is meant to clear the basic concepts of concurrency in Java and give you a bigger picture of how above topics are correlated. Maybe we will have individual posts to learn them individually. But you can refer to following links. They provide quite useful information. What is the difference of Atomic / Volatile / synchronize? Today I was going through articles on gracefully shutting down your Java process and came across the concept of Shutdown hooks in Java. You can register a shutdown hook which is a in-fact a thread and it will run before your JVM is shutdown and your program is terminated. you cannot register a shutdown hook after shutdown has been initiated. That means you cannot register a shutdown hook from a thread that is itself registered as a shutdown hook. Shutdown hook will not be called if Runtime.getRuntime().halt(status); is called. It abruptly shuts down the JVM. Why above example did not print the statement after System.exit() call? Code below System.exit() is not reachable though compiler doesn't really know it. Either an exception will be thrown or the JVM will be shutdown. The call never really "returns". So nothing after the exit() call is executed. Note : You can register multiple shutdown hook threads with the java process. All of them will get executed in parallel once JVM shutdown is initiated. How join() and yield() methods of Thread class work? A very general interview question on Threads in java. If you have 3 threads t1, t2 and t3 how would you structure your program such that t1 completes it execution before t2 and t2 before t3. To answer this question we need to know how join() method of Thread class works. causes the current thread to pause execution until t's thread terminates. Note : Like sleep(), join() responds to an interrupt by exiting with an InterruptedException. What we are doing in above code is that we are running a thread ThreadDemo from our main thread. Now in 1st run comment out the demoThread.join(); line and execute the program. This shows that main thread exited before ThreadDemo thread. What we want in next run is for the main thread to wait until ThreadDemothread is executed. So in 2nd run use the join() call. Here you will notice main thread will wait for ThreadDemo thread to complete it's execution. Only then the main thread continues with it's execution and terminates. Currently executing thread(whichever that is) will stop it's execution until the thread on which join is called has completed it's execution. Main difference between wait and sleep is that wait() method release the acquired monitor when thread is waiting while Thread.sleep() method keeps the lock or monitor even if thread is waiting. Also, wait for method in Java should be called from synchronized method or block while there is no such requirement for sleep() method. Coming back to yield(), it's little different than wait() and sleep(), it just releases the CPU hold by Thread to give another thread an opportunity to run though it's not guaranteed who will get the CPU. It totally depends upon thread scheduler and it's even possible that the thread which calls the yield() method gets the CPU again. I have copied yield() and diagram part from the link mentioned in the related links section below. However note that Object.notify() or Object.notifyAll() does not wake up sleeping thread. That part is not correct is diagram above. In this post, we will look at first two principles - Encapsulation and Abstraction. Data Encapsulation simply means wrapping relevant data together whereas Data abstraction means abstracting out the underneath logic and expose only the relevant part to the user. This is a very generic statement. We will get back to the what it actually means in Java language. Java is an Object oriented programming language, That means everything in java is an object and these objects interact with each other to form an executing program. Classes are nothing but blueprints of Objects and these classes form the very basis of Data encapsulation. We achieve data encapsulation in java by using access modifiers - Public,Protected,default,Private. We define functions or variables with some access modifier to control the extent of scope that can be used or accessed by the user. Common examples are declaring a variable private and giving its access using getter and setter methods or declaring a method private if it's only use is withing the class. This is also why it is referred to as data hiding. We hide the data and provide only desired access to it. Note: Keywords encapsulation and data hiding are used synonymously everywhere. It should not be misunderstood that encapsulation is all about data hiding only. When we say encapsulation, emphasis should be on grouping or packaging or bundling related data and behavior together. Data abstraction simply means generalizing something to hide the complex logic that goes underneath. Consider a very simple example of computer science - subtraction. If we have two variables "a" and "b" we simply say their subtraction is (a-b). But what is really happening behind the scenes? These variables are stored in main memory in binary format. The processor processes the subtract information which really takes place using two's complement method. Again in the processor, we have gates that actually carry out the procession. Even inside gates, there are pins and 1 and 0 simple means high and low signals. Even though the process is so complex underneath a normal software developer developing some financial application need not know every small detail. This is because the concept has been abstracted out. This is what abstraction means in a general terminology. We achieve data abstraction in Java primarily by using Interfaces and abstract classes. We only expose the method signature to the user. All user needs to know is what input or parameters he must supply to the function and what is the desired output or return value. Let's say we have an interface Animal and it has a function makeSound(). There are two concrete classes Dog and Cat that implement this interface. These concrete classes have separate implementations of makeSound() function. Now let's say we have an animal(We get this from some external module). All user knows is that the object that it is receiving is some Animal and it is the user's responsibility to print the animal sound. One brute force way is to check the object received to identify it's type, then typecast it to that Animal type and then call makeSound() on it. But a neater way is to abstracts thing out. Use Animal as a polymorphic reference and call makeSound() on it. At runtime depending on what the real Object type is proper function will be invoked. I would like to end this post by saying Data encapsulation(Data hiding) is wrapping and controlling access of logically related data in a class. One of the aspects of this is by using suitable access modifiers. Data abstraction, on the other hand, is generalizing the concept so that the underlying complex logic is hidden from the user. In java, this is achieved by using interfaces and abstract classes. Encapsulation is combining related logic data (variables and methods) whereas Abstraction is hiding internal implementation details and expose only relevant details to the user. 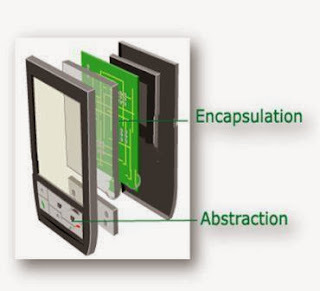 In a way you can Abstraction is achieved by Encapsulation. A generic diagram to understand the difference is provided below. Note complex logic is on the circuit board which is encapsulated in a touchpad and a nice interface(buttons) is provided to abstract it out.